I play tons of golf: Nine holes daily. I love it, but carrying a 20 pound bag three miles every day takes its toll. Everything hurts, from my wrist, to my feet. Maybe one day we’ll eliminate pain, but for now, at least we can make injuries hurt less, with wearables like Cur (the subject of this article). 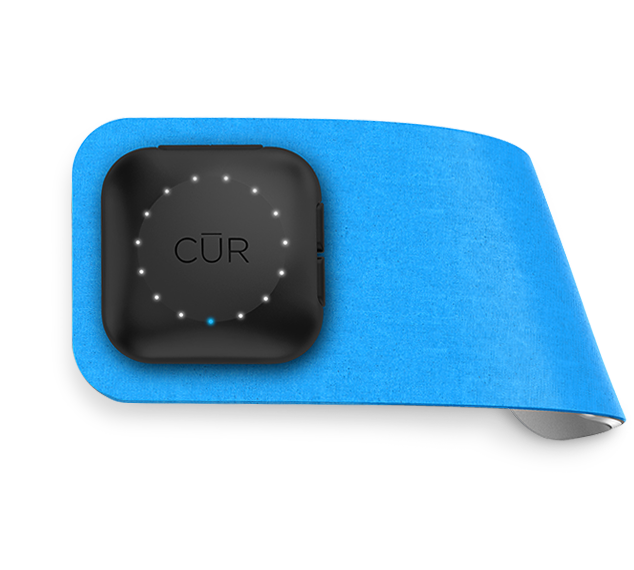 Cur (pronounced “cure”) is a wireless, wearable TENS (Transcutaneous electrical nerve stimulation)device. Cur’s pain relief comes from a little device built into a patch. You place the patch on what’s hurting, and it delivers targeted electrical shocks to cancel out pain signals. TENS is far from new, but Cur’s makers claim that an array of sensors and a layer of intelligence makes the Cur more effective, and easier to use than other TENS machines (it’s definitely better looking). What struck me the most about Cur was its size. Roughly the size of a large bandage, and wireless, Cur just looks a lot less threatening than other TENS devices. From a usability standpoint, Cur is also much faster out of the box. Within seconds, it automatically senses your pain, and implements a treatment plan. With a smartphone app, you can adjust treatment via bluetooth. The Cur is pretty pricey, ringing in at $300. Besides the sticker price, you’re also going to need to pony up cash for replacements for the gel bands that hold the Cur in place (they last around two weeks a piece, according to the company). Still, if Cur works (which I don’t doubt it does), this will sell well. Pain is a universal problem, and a problem that people are universally willing to spend large sums of money to solve. I love medical wearables, and it’s exciting to see new OTC devices like this coming to market. Still, nothing is as cool as this gadget giving sight to the blind.